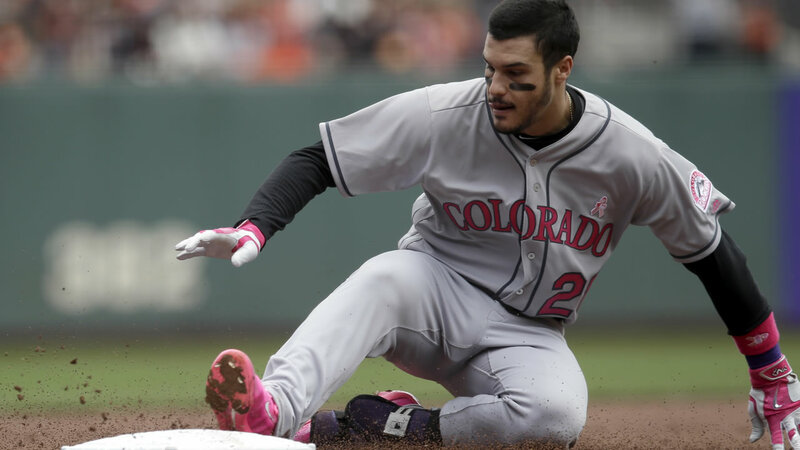 SAN FRANCISCO -- Nolan Arenado had three hits, Eddie Butler pitched six innings for his first win since being promoted from the minors, and the Colorado Rockies beat the San Francisco Giants 2-0 on Sunday. Gerardo Parra singled in a run and made a diving catch, helping the Rockies salvage a split of the four-game series. Rookie Trevor Story doubled and scored. Arenado, the majors' leading home run hitter, just missed hitting for the cycle for the first time in his career. The star third baseman hit a run-scoring triple off the brick wall in right-center in his first at-bat, singled in the third and doubled in the eighth. Hunter Pence had three of San Francisco's six hits to break out of a 3-for-15 slump. Jeff Samardzija (4-2) struck out nine in 7 2/3 innings and was charged with two runs and eight hits. Butler (1-1) allowed four hits and struck out six to earn his first win since May 30, 2015. Butler, a first-round pick in 2012, has five career victories - three against San Francisco. The Rockies, coming off a 13-inning loss on Saturday, gave Butler just enough run support. Boone Logan, Carlos Estevez, Chad Qualls and Jake McGee pitched the final three innings to finish the six-hitter. McGee worked the ninth for his eighth save. The Giants couldn't get much going in the series finale. San Francisco had a runner thrown out trying to steal third in the first, left the bases loaded in the second and stranded a runner at third in the seventh when Brandon Crawford and Mac Williamson struck out swinging. The Giants also put two on in the eighth before Qualls got Buster Posey to fly out. Samardzija lost for the first time since April 17.